Please login to your account before registering for an event. If you do not yet have an account and you are interested in a becoming a Member, please see the Membership page. If you want to register for an open class or event as a non-Member, please create an account here. Porch Party & Night Market! 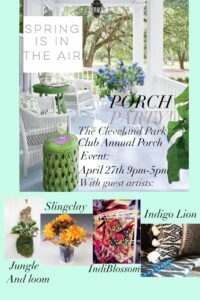 Cleveland Park Club Presents our Annual Porch Party Event! Mark your calendars for Saturday, April 27th from 5 pm to 9 pm for a night full of talented vendors, food and drinks. *Members please bring an appetizer and drink to share. Kids welcome, there will be a babysitter on site. This event is free. For the sake of a head count please sign up here. Or sign up in your CPC Profile, once you get into your profile, click the Scheduling tab, Camps/Classes, then Social Events.